I am really concerned about the treatment of art by modern society. I know that many of 20+ years old are not really interested in art at all and I think it is horrible. That is why in my practice I use a lot of materials for learning about art, making art and appreciating it. I have several art printables in my shop. 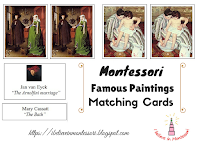 When I was making them I had an aim of making the whole series of art appreciation Montessori materials that will guide the Child from easiest to more difficult art concepts. 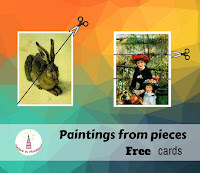 Finally, I have almost completed everything and you will start to see my printables from Level 1 of art appreciation to Level 10. Some of the materials you have already seen but still I will write a post about each because I have remade almost every of them. I will show how to use it and write instructions so you can understand my ideas easily. Why have I decided to make such series? I am not some art geek, I just want children to be more in the art. I can honestly tell you that here, where I am living now (I live in a small town), adults doesn't like art at all. It is not interesting for them. The Same situation was when I was living in the city though I was studying in the Institute of Culture and Arts and it was full of creative people whose passion was art. But outside of it, you would look strange discussing painters. So why so many people don't understand art? To my mind, they just have not used to it. I was writing in some post that almost all our likes and dislikes come from our childhood. If in the childhood we were eating a lot of fish because our father was fisherman we are more likely to eat it in adulthood. As I can remember from my own childhood we were not visiting some art galleries together with family and that was not only my family. Such places are not that popular as zoos or parks. We were visiting art gallery one time at school together with class. That is what I remember. That is how a lot of people there were raised. And this is not because our parents are bad they were raised in this way also. So to make our Children like art we need to show it to them from the youngest age. In the end, they will treat it as the way of living and they will appreciate art. It is important because art shows us the beauty of the world, it helps us to speak out, to show our insides, to be more educated, to educate the soul. During my training, we never discussed some kind of art appreciation materials sequencing or something so I decided that would be cool to have at least approximate approach to learning about art Montessori way. In Montessori education, we go from general to specific. So I thought that it would be logical to start art study from learning the art forms and then digging deeper. Again this is just a general idea and we can not strictly follow it, we need to follow the Child. We need to look if he is ready for this material and maybe propose him another from the series. For example, this material would not be the perfect choice for 1-year-old because it shows a lot of abstract concepts, but with other Children of age 2.5-3 years I would use it. 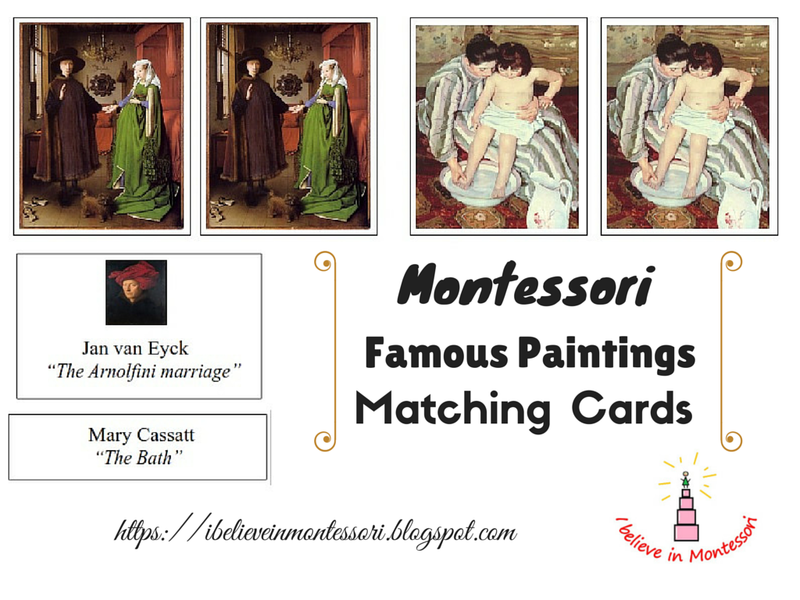 Though I will use my matching paintings material even with 1-year-old not looking at the fact that it is not the first in the series. 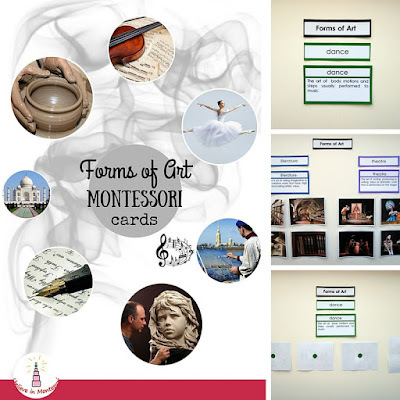 So our Level 1 of art appreciation is "Forms of Art Montessori Cards"
The material shows 12 wonderful art forms and suggests a Child to match beautiful pictures to corresponding labels. Art forms include music, theater, animation, handcraft, circus, architecture, dance cinematography, literature, sculpture, painting, and photography. The material should be color-coded. I made one version with color labels and dots that you need to glue to the back of pictures or you can use a black and white version and glue the cards to the colored paper of your choice. I even think that it is sometimes easier and faster to use your own color paper because I don't really like to cut all the small color dots, and if you have puncher you can make them really quick and they would be of perfect size. But even though I mostly use printed color versions because sometimes I buy color paper that hasn't got enough color choices to color-code my materials. Before using material show the Child several art objects, it can be anything paintings, photographs, handmade goods, Show all this things and tell that all this is art. You can also make some label where the word "art" is written and show it with objects. Then choose some pictures from Art Forms Material about 10 and again show them together with "art" label. After this, you can learn about art forms. 1. Tell the Child that human is a creator. He has a wonderful ability to turn his ideas and thoughts into reality and art helps him to do it. 2. Tell that there are many ways how you can create wonderful things. There are a lot of art forms. Show him the label “Forms of Art” and put it in the center. 3. 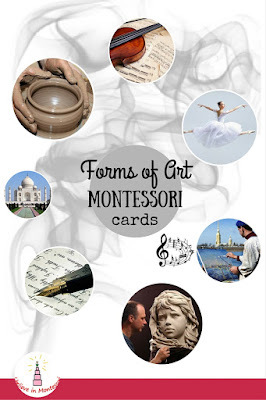 Don’t use all the cards in the beginning, you can do it only on the very advanced level when Child already knows all the art forms and if he really wants to do it. Choose one form in the beginning. 4. Take art form, show its label. Name it. Read the description card and put it under a label. 5. Show corresponding pictures one by one and put it one under another or in the line. 6. Look at the result. Turn the pictures over and look at color dots. 8. When it is done tell “Look how there are many wonderful art forms, you should try all of them”. three art forms and so on. Color dots will help Child not to get lost. You can work only with labels. Read description card and put it to the right label. If the Child can read give him the opportunity to read the cards. It would be awesome to show some real representation of art form to the Child, like photo camera and photography study or handmade jug for handcrafts. Children love it! You can purchase material HERE. 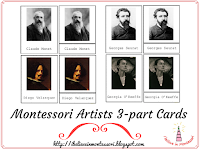 I hope you are curious about this material as much as I am because I spend sooooo much time on them to make them correspond to my ideas of ultimate set of materials for Montessori Art Appreciation. 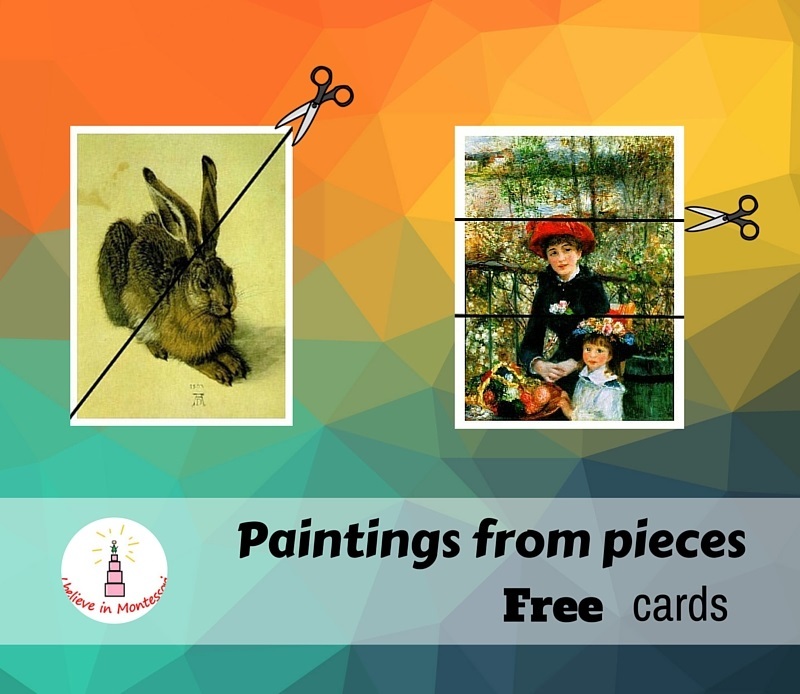 These art printables are awesome! 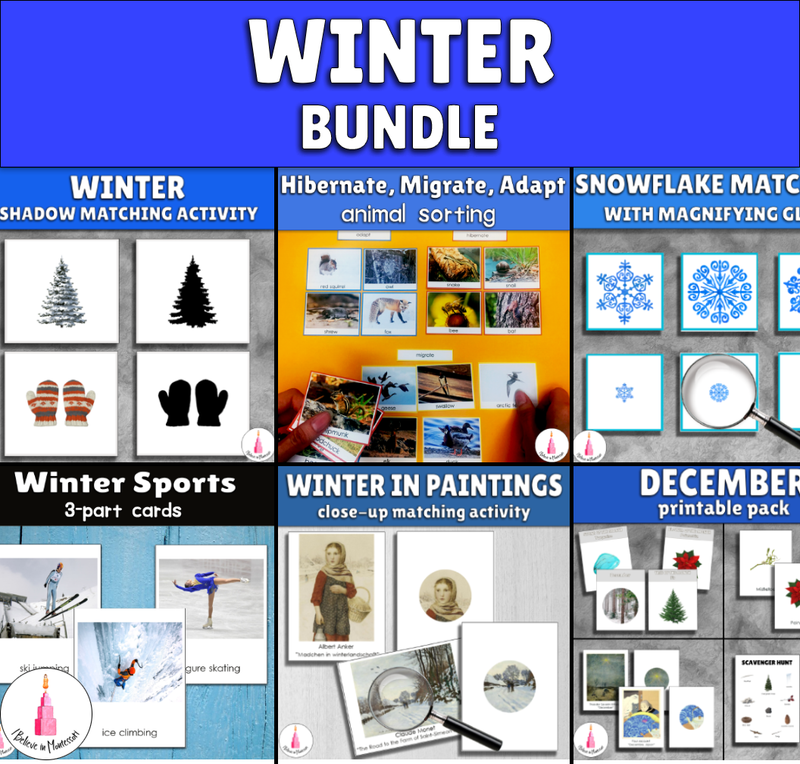 I agree that art is very important and I really appreciate you creating all these gorgeous printables for us to use.